Ash puff from the summit of volcan Villarrica, Chile. Photo by David Pyle. Villarrica is a classically cone-shaped volcano in the south of Chile. It is a tourist destination for skiing, hiking and white-water rafting, as well as for volcano-watching, and is easily accessible from the nearby town of Pucon. Villarrica is a stratovolcano, and one of the many active volcanoes of the Southern Volcanic Zone of the Chilean Andes. This section of volcanoes has formed in response to the subduction of the Nazca plate beneath the South American plates, and stretches along the backbone of Chile for over a thousand kilometres. There is at least one eruption from any volcano in this arc, on average, every year. How does Villarrica stack up as a Top Trumps Volcano? Last known eruption: early in the morning on March 3, 2015, Villarrica entered a phase of vigorous ‘Strombolian’ fire fountaining. In this, the first eruption since 1984, a column of molten rock rose high into the air, in a short ‘paroxysm’ that lasted about 30 minutes. The scores on the cards are based on what we know about the past and continuing activity of Villarrica. Explosivity (Volcanic Explosivity Index) – 5. While most of the recent and historically-documented eruptions of Villarrica have been relatively small, the volcano does have a more dramatic past. About 4,000 years ago some violent eruptions formed the so-called ‘Pucon Ignimbrite’, in an eruption that rates as a 5 on the volcanic explosivity index. Another series of eruptions about 16,000 years ago may have been larger still, forming deposits known as the Lican Ignimbrite. Height – 2847 m. Villarrica is a classical cone-shaped ‘stratovolcano’, that rises over 1500 m above the surrounding countryside up to the summit. The summit is a pit crater, a little over 150 metres across, and for the past few decades this has contained a small lava pond, whose level has gone up and down periodically. From the top, there are breathtaking views of at least seven of the other volcanoes of the Southern Volcanic Zone. Deadliness – 12. Past eruptions of Villarrica have caused significant disruption, and multiple deaths, mainly due to the effects of lahars, or volcanic mudflows, that often accompany eruptions at this volcano. Lahars are one of the most prevalent and serious hazards at many volcanoes, as they can often be triggered (for example by snow-melt, or rain fall) without there being any significant eruption. Wow factor – 74. Villarrica comes pretty close to the ideal of a volcano, with its snow-covered cone rising majestically above the town of Pucon and lake Villarrica. It is easily recognisable as a landmark from many tens of kilometres away, and a glimpse into the steaming summit crater more than makes up for the 3 hour climb to the top. Unpredictability – 26. Villarrica is one of the best known, and most frequently active, volcanoes of southern Chile. While it has had some larger outbursts in the past, for the past few hundred years most of the activity at Villarrica has been confined to frequent small to moderate explosions from the summit crater, and occasional lava flows from the summit and flanks. For the time being, it seems likely that this pattern of activity will continue, and for this reason the unpredictability score is fairly low. Devastation Potential – 163. Activity in 1971 caused some significant destruction, as the lava flows caused rapid melting of snow and ice, and lahars ran down several sides of the volcano. Lahars are probably the main continuing hazard at Villarrica, as they could be triggered with relatively little warning from even a fairly small-scale eruption. Fun Fact – in mapudungun, the language of the native Mapuche, Villarrica is known as Rucapillán (also Ruka Pillan), or the house of the spirits. Other synonyms include Quitralpillán, ‘fire house of the spirits’. The town of Villarrica was established in the 1550’s by Gerónimo de Alderete, to exploit gold washing in the area. Villarrica is a very well monitored volcano, and there are many accessible sites that contain information about the volcano. 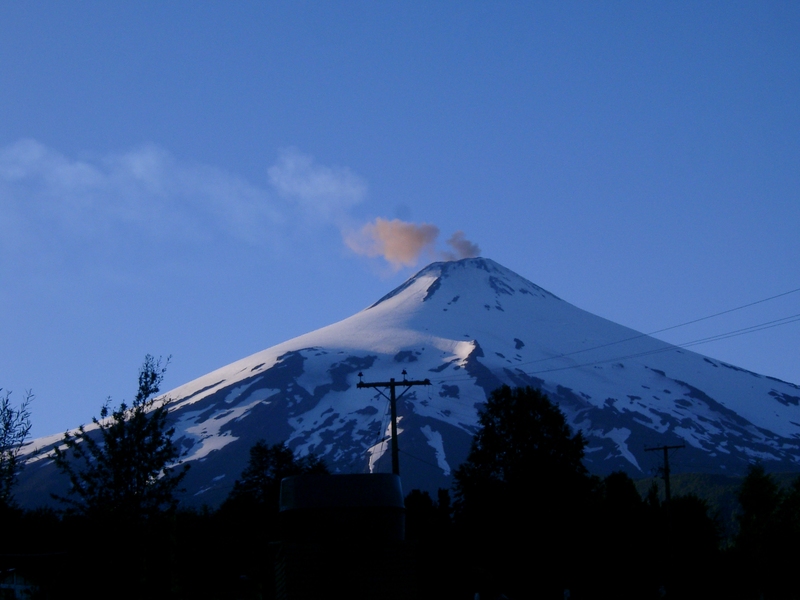 The web pages at www.povi.cl are maintained by POVI (the Proyecto Observación Villarrica Internet) and include links to webcams, and other observations (both visual, and satellite) relating to the current state of activity. The Chilean Geological Survey (SERNAGEOMIN) also host a formal page that details the current alert levels and state of the volcano, and a set of webcam images.